Hardwood Spades game gives fantastic 3D graphics and background music to the classic spades game. This makes playing spades just gets you a lot of fun moments. 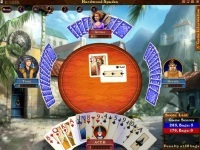 Play offline mode against computer or play online/multiplayer mode to deal with other spades fans across the world. What makes Hardwood Spades very special is the 3D effects and animation on its whole layout. This won't make you bored or tired of sitting in front of the screen. Just give it a try and see the beautiful scene it offers to you. Another kind of card game using standard cards of hearts, clubs, spades, and diamonds. Play freecell solitaire games including Stalactites, FreeCell Two Decks, FreeCell, and Eight Off for free.